Imagine that mouth watering, appetizing pizza served hot out of the oven. Accompany that with a really nice cold beer from our extensive range of beer brands, our signature flavored beer or even our new international beer. Pizza & beer time with your family, friends, colleagues, or just hang out with yourself at the bar listening to great music or watching the latest sports game. 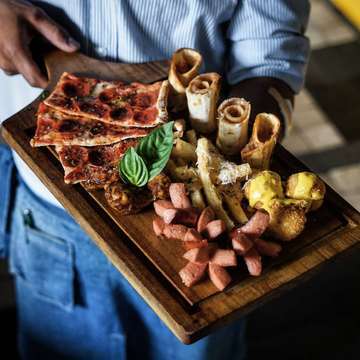 At Pizza e Birra, we commit ourselves to serve you one of a kind Italian pizza with a twist, inspired by the classic traditional, old and new pizza pies, not to mention affordable and good value price that doesn’t hurt your pocket. Our menu ranges from appetizers, such as Baldy’s Special Salad and Chicken Wings, to our signature pizzas, Deep Dish, to pasta selections & main course, and finally our delicious dessert pizzas. With our relaxed fun atmosphere in an airy warehouse space, you will surely feel that you are somewhere far away from the hectic city life. Our main obsessions are PIZZA, BEER, SPORTS and FUN! Terkenal dengan menu pizza-nya, di sini kamu juga bisa menikmati chicken wings-nya yang juga menjadi favorit orang banyak di sini. Untuk pilihan saus favorit, pesan deh Honey Mustard Chicken Wings. Ayamnya yang renyah dengan saus honey mustard-nya menghasilkan cita rasa yang gurih dan manis. Untuk bisa menyantap menu ini kamu perlu mengeluarkan uang sebesar Rp 65 ribu. Saat bertandang ke Pizza E Birra, kamu tak boleh sampai melewatkan menu baru yang diberi nama Blackcurrant Semifreddo. 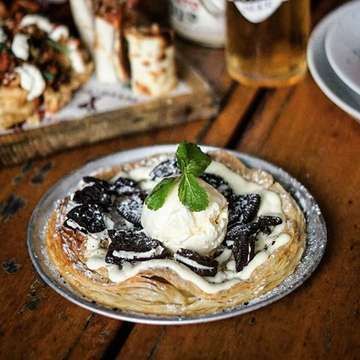 Pasalnya, dessert dingin yang memadukan cita rasa manis dan asam ini memiliki sensasi segar yang sanggup memanjakan lidah.